CLYDE have scrapped most of their youth development programme after SIXTEEN coaches were enticed to Hamilton by ex-Clyde chief executive Ronnie MacDonald, who bought the second division club last week. 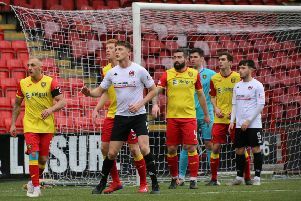 As well as the coaches, most of the players from the under-10 to under-15 squads have also gone to the lower league side and in the current financial situation, the Clyde board have decided it would be uneconomic to bring in replacement coaches and players to keep the youth teams afloat. Clyde director Gerry Dunn said: "Many of the coaches have left so we would have had to have replaced them. It would be a huge job to do so and set up the teams with a lot of the players joining their coaches at Hamilton, and at the moment we have to be very prudent financially. "We will have two teams below the first team next season. These will be either under-17 and under-19 or under-16 and under-18, we are just waiting for the SFA to decide what age groups they are going to run leagues for. "Our main aim is to maintain the player flow into the first team and longer term when circumstances allow it, or if we get into the SPL, we will look to expand the number of teams we have. "We will still be running a number of coaching centres in Cumbernauld and other areas next season, so our grass roots commitment is still there." Over the past twelve months Clyde have heavily promoted their "Keeping the Jersey Warm" initiative which was to raise funds to help in the running of the youth teams, even going so far as to hold a successful sportsman's dinner in Glasgow. Gerry though doesn't see the project as having been a waste of time, given the current climate. Gerry said: "The initiative was a great thing to have done and we will still be doing it next season as we will have youth teams. We also have to respond to reality and keep it going so there is a base when the number of teams increases. "What we also have now is a reputation for having a quality youth development programme so there is no point in stretching things, as this could mean that the quality decreases." Gerry also claims the club does not feel any anger towards Hamilton for enticing the Clyde coaching staff or towards the coaches themselves for a lack of loyalty. He said: "The coaches will have done what they think is the right thing for them. What we have to do now, is concentrate on our own club and that really leaves no place for bitterness." Les Gray who was Clyde under-11 coach has joined the Hamilton board as Director of Youth Development and John Bean who was Head of Youth Development has moved to take over the same role at Accies. John and Les are joined by 14 other coaches at the Ballast Stadium who were employed at Clyde. Paul Ronald, Derek Steel, Arthur McJimpsey, Eric Williamson and Alan Harvey have been charged with setting up a youth academy in Cumbernauld to get the best talent in this area into the Hamilton Accies family. John Bean revealed it was quite an easy decision for him to leave Clyde and join up with their Lanarkshire rivals. He said: "I have always found Ronnie MacDonald to be an honest guy so when he approached me about creating a top youth development programme and creating a real community club I was delighted. I was the only one who re-signed, the rest of the coaches approached me as they wanted to leave. "The problem the Clyde board has is that they are fighting against their own success and didn't have the finances to back up the youths. When I told the Clyde board I had been approached by Ronnie there was nothing they could do to counteract. Ronnie has told me everything I wanted to hear and he has never let me down before. "I had to take a bit of time over the decision to leave due to the players. I knew Clyde weren't going to run the teams from under-10 to under-15 level and I had promised the young guys football, which I was determined to deliver on. I was very proud when six players who I have seen come through the ranks made their first team debuts this season and I wish to carry that on at Hamilton. "After five years at the club I still have a lot of affection for Clyde and I hope they do well in coming seasons. Billy Reid (Clyde assistant manager) is still one of my best friends and I have no doubt with he and Alan Kernaghan running the team they will get into the SPL." Also on his way to Hamilton is striker Stevie Convery who joins up with Ronnie MacDonald, Allan Maitland and George Fairley for the second time, having been signed by them for Clyde from Arthurlie in 1998. Gerry said: "It is no real surprise to see him go as he was the only part-time player left at the club but everyone at the club has tremendous respect for Steve and it is sad to see him go. "Having said that, he himself recognised the progress being made in the first team and the fact the standard was probably too high for him to be playing on a regular basis and has went to Hamilton to try and get first team football." Hamilton Academical's chief executive, George Fairley said: "We are delighted to get Stevie on-board as we have worked with him before and know what a honest, hardworking and committed lad he is. "He wanted a fresh challenge so we were happy when he turned down Clyde's offer to move here. Despite his lack of a settled position at Clyde we see him as a forward player and along with Brian Carrigan and Brian McPhee we could actually have an entire forward line of ex-Bully Wee strikers."